If you are reading this then you almost certainly own Mohamed Salah. The Egyptian winger has been sensational for Liverpool this season and fantasy managers have responded by adding him to their teams by the thousand. At the time of writing is ownership is up to 51% and his value has increased by almost a million pounds since the game started. Today's piece is not about him though, but his colleague who hopes to operate on the other side of the field - Sadio Mane. A red card, injury and the form of Salah have pushed Mane out of many managers minds, but as teams begin to converge and differentiation becomes increasingly difficult, the Senegal star is a promising option. First, a quick word on Liverpool. I think many people might be hesitant to invest close to 20 million on two Liverpool players (assuming you already have Salah) but I might suggest that fear is misplaced. They've scored just two goals less than Man United, four more than Arsenal, five more than Chelsea and ten more than Tottenham (based on Kane's 37% ownership and Eriksen / Ali's combined 30% ownership I'm assuming many manager out there has over 20 million invested in a Spurs duo). Liverpool are 3rd in shots inside the box, 3rd in total shots, 2nd in shots on target and 3rd in created chances. Opta's xG metric also places them 3rd with 29.3 expected goals to date. While they can't match Man City's firepower, one major advantage to this Liverpool side is that there is no real question as to how the attacking options will line up when all healthy and not being rested. Salah, Mane, Coutinho and Firmino are a terrific foursome - as evidenced by some of the football on show against Spartak Moscow this week - and there's really no one knocking at the door and demanding minutes to replace them, other than when they simply need a break. There is a perception that Klopp is rotation happy, but putting aside his injuries and suspension, Mane has only been benched twice, and one of those games he didn't feature at all, which would have at least allowed your sub to come in. With Champions League football now behind us for a couple of months, I would be very surprised to see Mane miss more than the odd game over the next 6 weeks or so, and the fact he sat out against Brighton could actually be seen as a good thing, and he's less likely to be on the rotation block in the next couple weeks. Contrast that with Man City where one of Aguero and Jesus needs to sit almost every week and the likes of Bernardo Silva and Gundogan are waiting in the wings to steal minutes from your fantasy men, or even across the city at United where only Lukaku and Pogba (when available again) are really locked into that team. Mane isn't in the same class as the top three picks here, although they each come with a drawback, be it saturation of ownership (Salah), price tag (Sanchez) or rotation threat (Sterling). Among the rest of the group though, Mane can certainly hold his own with my biggest concern being the lack of xA which might suggest he's a little one dimensional with his fantasy production. That said, his 1.8 CC per 90 mins and his 13% share of Liverpool's CC when he plays aren't bad numbers so there is hope that his assist threat might tick up a bit as he plays a few more games. I think the biggest shock name on here might be Hazard who doesn't seem to get much love from xG models. I suspected this was a flaw in my own numbers (my player projections don't tend to rate him as elite either) but it looks like he suffers under Opta's model too. 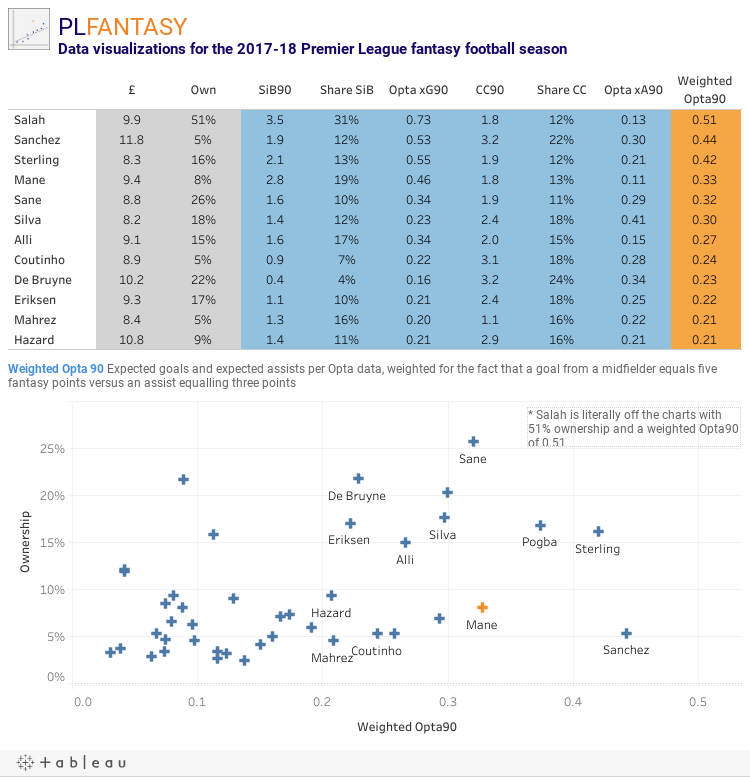 This is worth digging into as to why Chelsea (and Hazard specifically) might be outperforming their underlying numbers, but however much you inflate him numbers, it will be tough to justify the extra 1.4m investment required to get the Belgium over Mane, based on these numbers alone (strength of fixtures and team coverage also need to be covered of course). In the remaining six fixtures of 2017, Liverpool are set to welcome Everton, West Brom, Swansea and Leicester to Anfield, with a tricky trip to the Emirates being the only obvious concern, although even then Arsenal only rank 9th in xG conceded at home. After that there are a few tricky games over a relatively short period, but that's also getting into the new transfer period when wildcards are in play so I am personally happy to try and milk this underrated Liverpool side for the next month or so, letting everyone else put all their money into Chelsea or keep it in a Spurs side who have failed to hit the expected heights so far this year.